René Reifarth, Professor for experimental astrophysics at Goethe University suggested a solution as early as 10 years ago: The low energies within the Gamow window range can be reached more precisely when the heavy reaction partner circulates in an accelerator in which it interacts with a stationary proton gas. He achieved initial successes in September 2015 with a group of Heimholtz early career researchers. Since then, his team has gained excellent support from Professor Yuri Litvinov, who leads the EU-funded research project ASTRUm at GSI. In the experiment, the international team first produced xenon ions. They were decelerated in the experimental storage ring ESR and caused to interact with protons. 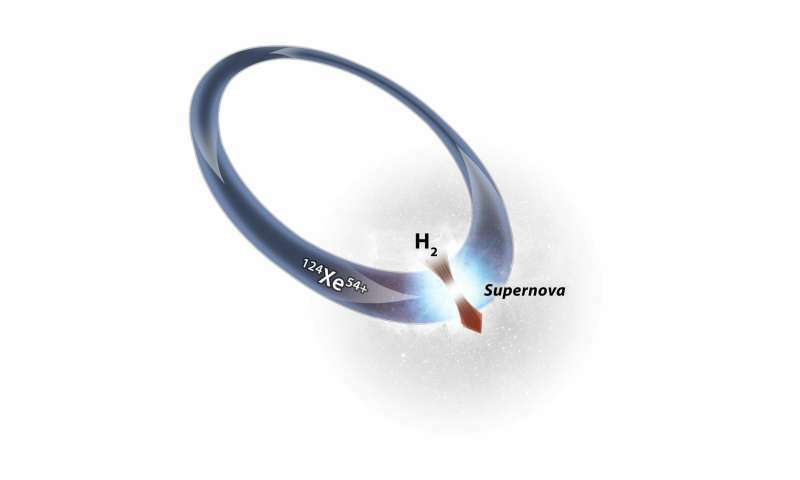 This resulted in reactions in which the xenon nuclei captured a proton and were transformed into heavier caesium—a process like that which occurs in astrophysical scenarios. The extreme release of energy in astrophysical objects is accompanied by outflows, sometimes superluminal. It is important that these phenomena are observed on the scales from stars to galaxies, setting off a unity of explosive processes. But the nature of the central engines remains unclear. In our model all these phenomena have a common nature and the central engines are elastons. Excellent! This experimental data will allow us to understand the conditions in supernovae and neutron stars that formed these elements. To my mind after the formation of electron proton and neutron the heavy noble elements took the form as He, Ne Ar, Kr, Xe Rn and one more. Rn was the first and He was the last. Rest is for experiment. This kind of basic research in nuclear 'chemistry' is essential. We seem in this akin to our first forays into chemistry in the 1800's Russians seem to be ahead of us, but that may be an illusion as we hide a lot in order to benefit big business here and maybe other places. The Russians seem more interested in getting the job done so the benefits can be applied to space exploration and civilian power purposes to heat cities sprawled out over vast territories not now served by maybe a continental grid system.